Nothing quite prepared me for the thrill of seeing some of the last remaining 800 mountain gorillas on the planet calmly sitting four feet in front of us. They weren’t in a zoo, but deep in Uganda’s Bwindi Impenetrable Forest, where half of all the mountain gorillas live protected in a mountain jungle bordering Rwanda. Gold was mined here until 1991, when Uganda declared Bwindi a National Park to protect these endangered creatures. UNESCO declared it a World Heritage Site in 1994. Since then tourist visits to trek with the gorillas and the monies raised by the permit fees have sustained and protected these animals’ very existence. We were in Uganda to visit our daughter Sarah, who has been serving there as a Peace Corps Volunteer for the past 18 months. And when in Uganda, one treks with the gorillas. So off we went. After a flight into Kihihi airport in the southwest region of Uganda, a charming host from Mahogany Springs Lodge, where we were staying, met us on the grass airstrip. Everyone staying at the Lodge was going gorilla trekking, so we all had the same itinerary. We soon learned we needed to be up at 5:30 the next day because we were headed to the furthest park entry point. Two hours later, after a bumpy drive through spectacular gorgeous scenery of the Rift Valley, dotted by tiny hillside villages and numerous tea plantations, we arrived at our designated entry point. We were split into two groups of 10 and set out on our daylong adventure, accompanied by porters, security guards, and very informative Park Rangers. Thank goodness for porters. I had no idea I needed one, and I highly recommend them for any future trekkers out there. I had erroneously imagined a leisurely hike on a well-marked trail, with switchbacks to mitigate the steep inclines. It is a jungle after all, and a natural habitat, not a regular hiking trail. 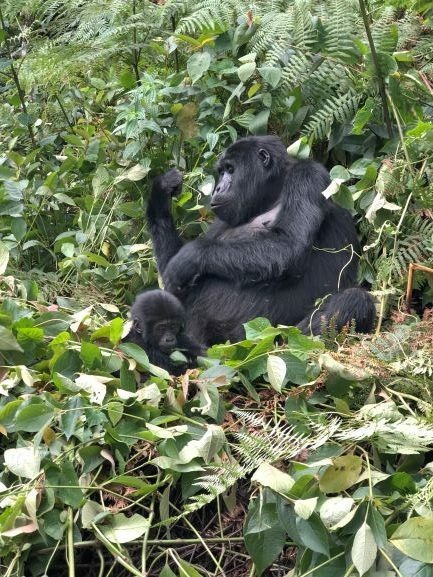 So, to get to where the gorillas are, one needs to go up and down steep ridges and across valleys (all beautiful) for a couple of hours to get to the gorilla family. The porters are there to help you up 40-degree inclines, and down. Because gorillas scramble up hills to get to better vegetation, we scrambled through vertical vegetation along with them, albeit less nimbly on two legs instead of four. Amazing doesn’t capture how incredible it was to see them. There we were, deep in the mist-covered forest, at an elevation of nearly 8,000 feet, watching a gorilla family having a lunch of leaves. The protocol is a one-hour visit, so we stood close by, entranced by mothers caring for babies, others playing, all eating. These gorillas are one of nine groups that have been acclimated to humans, so they ignored us. Once our hour was up, it was time to leave the gorillas and retrace our steps. Our guides bushwhacked a path out of the vegetation, and after awhile we stopped to eat the lunch, which our Lodge had provided and our porters kindly carried. We sat on a bed of vines and chatted about the day. By 4, we were back at the top of the ridge, our driver waiting with refreshing water for the return drive. Humans and gorillas share a 98% DNA match; we fondly referred to them as our kissin’ cousins while we were trekking. 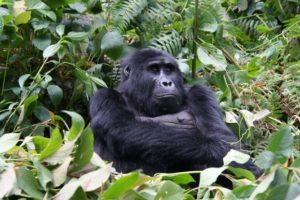 Luckily for humanity, tourism and the trekking fees have created a local economy where saving these gorillas is good business, as well as good for conservation. I’m grateful to have seen the gorillas in person, in their natural habitat, and gained a better understanding of how we share not only much of our DNA, but also this world. Yes We Have No Bananas! !